Sticky Header Created by themekiosk. This templates have specific characteristics, namely: Sticky Header is the top navigation bar that remains at the top of the page even when a user scrolls the page.This makes navigating to other parts of the site . Sticky Header is the top navigation bar that remains at the top of the page even when a user scrolls the page.This makes navigating to other parts of the site easy. It also uses some CSS3 features like rounded corners or text shadow, and those effects won’t apply on older browsers , but this doesn’t affect the functionnality. 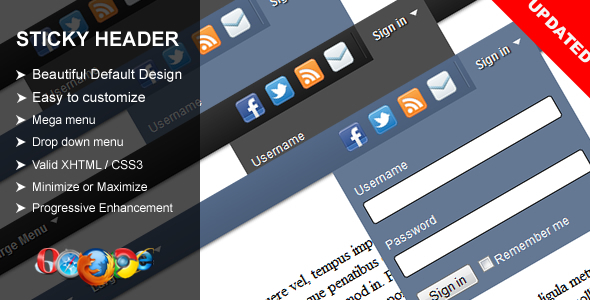 Fully customize your Sticky Header to match your website’s design. Customize your themes with CSS in the main file. Sticky Header comes with 6 default colors. You can also create your own color scheme by editing the CSS file. Sticky Header support mega drop down menu. You can create up to 12 columns menu based on the 960 grid system. You can also add multi-level dropdown menu to your Sticky Header. You can minimize or maximize the Sticky Header with the built-in control. We have tested Sticky Header to ensure it is compatible with the all modern web browsers like Firefox, Internet Explorer, Safari, Chrome, and Opera. You can choose how to open the menu, by using mouse hover or click. We have created the completed help document that will make it easy to implement and customize the Sticky Header.